Queen of White . . .
Cross-country running is the outdoor activity to which I am most closely attached. Most of my writing has focused on the fly fishing I do and, to a lesser extent, the use of the mountain bike as a mode of transportation to and from angling destinations. Running has always been a personal activity, a lone wolf exercise that allows me time spent in the moment, time when I can exert myself most intensely and put my values of persistence and perseverance to a tangible, physical test. My vehicle is myself. A daily run also guarantees me active engagement with the outdoors. An autumn morning spent in the open air can provide a variety of peak experiences. Park lawns covered with colored leaves and paths lined by fading wildflowers can inspire the amateur naturalist as well as the amateur athlete. This is how I found a flowering species that had eluded me all season. I discovered the plant in full bloom while on a run that unwittingly followed the kind of path described by the poet Robert Frost in his collection Mountain Interval. My habit is to trace a route south along the Hudson River toward the World Financial Center and then return, finishing at the piers parallel to the West Village. This week, with a new desire to run the hilly lawns on the north side of the Chelsea Piers Sports & Entertainment Complex, I headed north for the first time on the Hudson River Park path. This decision quickly took me to the very northwest corner of the area I had mapped out for Wildflowers of the West Village. 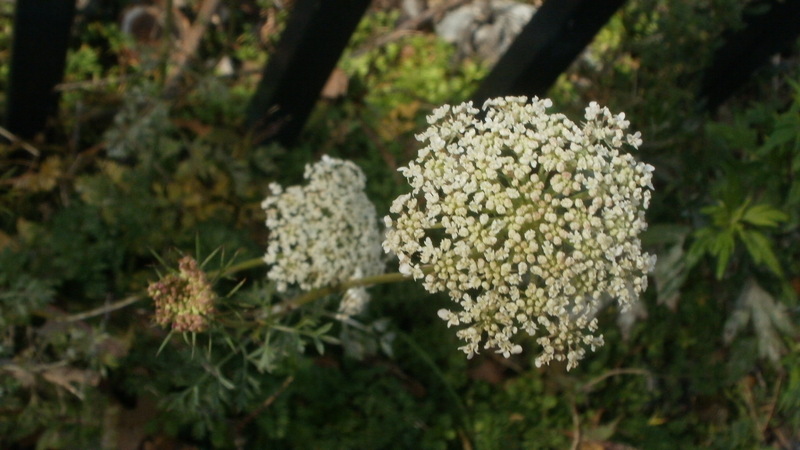 There, near the intersection of 14th Street and the West River Highway, the white theme continued as I found blooming examples of the most distinct white wildflower of all: Queen Anne’s Lace, the wild carrot, Daucus carota. Earlier in the autumn I described my stumbling upon Poison Hemlock, which has a superficial appearance to Queen Anne’s Lace. I had confidence in my identification because the plant’s umbels were irregular, lacked a purple floret at the center, and did not age into a bird’s nest shape. 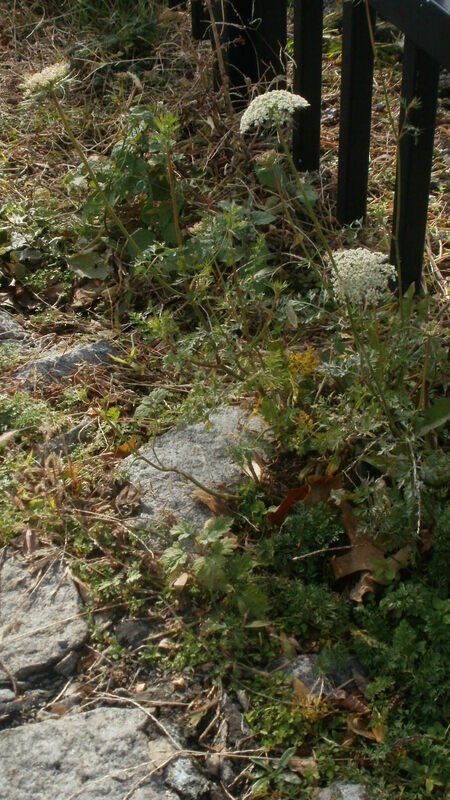 The much more common Queen Anne’s Lace could not be found, despite hours of searching; I concluded that the neighborhood’s gardens and parks were tended too regularly for mature, blooming examples to appear. Ironically, it was a pier that allowed these examples to reach the flowering stage. Pier 54, which used to be the home of the Cunard Line, has fallen today into marginal use, primarily as an outdoor space to screen films in the summer. The stretch it occupies between the Meatpacking District and Chelsea Piers complex holds onto the grizzled industrial character that the entire area had before a redevelopment in the 1990s that is managed now by the Hudson River Park Trust. The green lining to this situation is that the edges remain free of regular maintenance, and cutting, and along one iron fence I found the Queen Anne’s Lace in bloom. 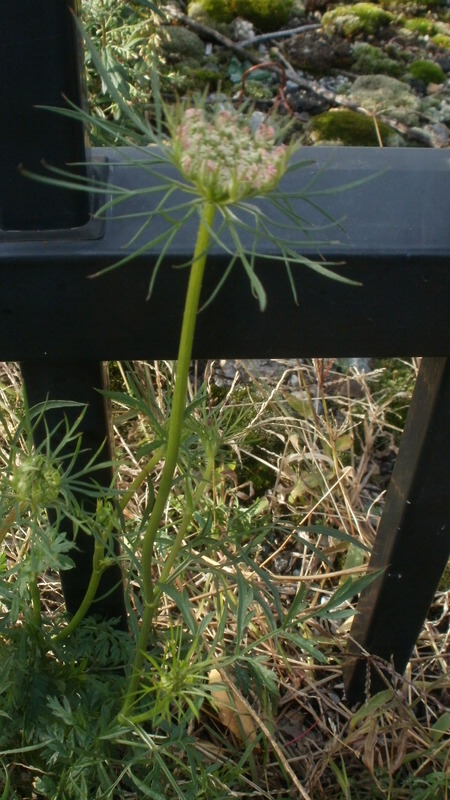 The wild carrot is a biennial European immigrant from the family Apiaceae. The plant can be distinguished by its tri-pinnate leaves that resemble the ones found on store-bought carrots. The flower begins as a tightly-knitted umbel supported by a wide bract that ends in slender, sharp green tips. As the bloom opens, it undergoes a change from a pale red wine color to the bright white of the mature form. There is often a single purple floret at the very center of the flower head. As it ages, the entire structure shrivels into a bird’s nest that ultimately breaks off the main stem and becomes a tumbleweed of sorts. Queen Anne’s Lace is quite common along fields and roadsides in the American northeast. My experience shows that it is much less common in the urban area of Manhattan, but the search did provide me with another good reason to just do it, to take the road less taken, and go for a run.